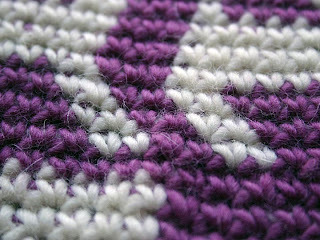 I love Carol Ventura's work (check out her gallery on Ravelry) and have wanted to try tapestry crochet for awhile, but I never quite got around to it. Last night I was looking for a new project for my June block-a-month class (we're branching out from just squares) and came across Carol's felted amulet bag. A little searching, a little planning and I came up with this - a cat and blocks purse using the kitty graph* on Carol's site. It took me a little less than 5 hours to complete - including weaving in the tails (pun intended) - using worsted weight wool left over from other projects and an "I" crochet hook. I think it's cute and a good intro to tapestry crochet. 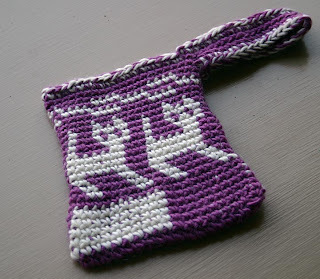 Now I need to find the pattern for Carol's flying pigs purse, my absolute favorite, which seems to have disappeared from the innerwebs. 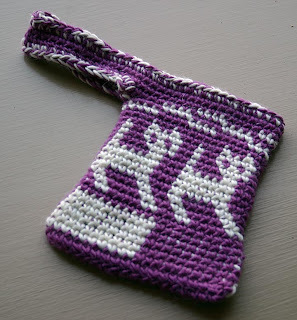 *Carol kindly gives permission to use the kitty purse pattern for teaching purposes, with certain restrictions.